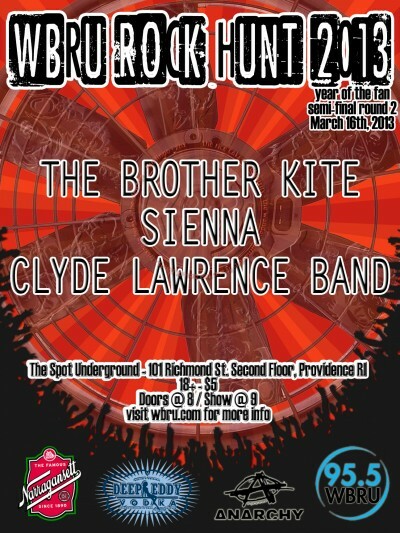 WBRU’s Annual Rock Hunt kicks off this weekend. Here’s more on all the bands and the shows. Hi Neighbor, Have a ‘Gansett! The Rare Occasions (Barrington, RI) – After making their mark on the Providence rock scene with their reputable act, members from 2010 Rock Hunt Semi-finalist The Valar, drummer Luke Imbusch and singer/keyboardist Brian McLaughlin decided to take their unmistakable sound with them to Boston. There, they teamed up with bassist Jeremy Cohen and guitarist Peter Stone and began constructing a set more formidable than their last. In their time together thus far, they have self-recorded and self produced a three-track demo, won the Tufts University Battle of the Bands and have opened for Guster, Lupe Fiasco, The Wandas, Fairhaven, and Those Mockingbirds. Satellites Fall (Coventry, RI) – In February 2012, Satellites Fall released their first EP, “Lines in the Road”, which received positive reviews. The track “Servitude” gained them entry into our 2012 Rock Hunt as semi-finalists. Later that year, Limelight Magazine nominated “Lines in the Road” for Album/EP of the year and their single “One Night” for Song of the Year. 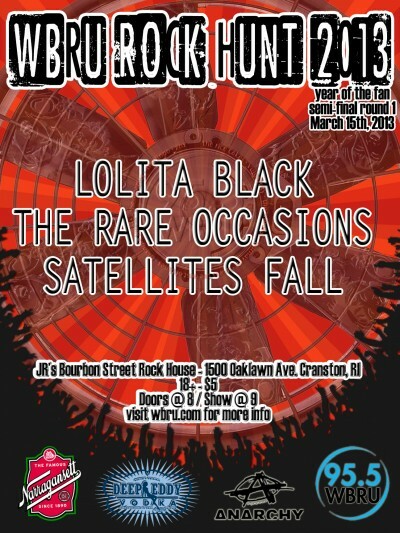 They have shared the stage with bands such as Sponge, Hoobastank, Electric Six, Taproot, and The Trews. The Brother Kite (Providence, RI) – Providence, RI’s The Brother Kite began crafting their shoegaze-inflected rock sound in 2001, when founding members Patrick Boutwell and Jon Downs began writing and recording original material as a duo. Bassist Andrea Mason and guitarist Mark Howard joined them in 2002, and the band released a split 7″ record with friends Vaguely Starshaped on Boston’s Losing Blueprint Records. The band has been touring relentlessly since, gaining positive praise from reviewers such as Pitchfork, who claimed that their full-length ‘Waiting For The Time To Be Right’ had “more than enough wow moments to listen to over and over”. Their music has been featured on MTV’s “The Hills” and Skins (UK) and they played 2006, 2008 and 2011′s SXSW. The Brother Kite has shared the stage with Dum Dum Girls, Civil Twilight, Frightened Rabbit, Danielson and Blind Melon. They are currently in process of releasing their 4th full-length album, “Model Rocket”. Clyde Lawrence Band (Providence, RI) – Clyde Lawrence is a musician, songwriter and native New Yorker who came to RI by way of Brown University. He began playing piano at age 4 and started writing music soon after. At age six, he wrote a song that was featured in the movie Miss Congeniality (2000). While attending the Dalton School, Clyde continued composing music for major motion pictures. He wrote the song “Dance With Me Tonight,” performed by Hugh Grant in Music and Lyrics (2007). He has worked with and been produced by Adam Schlesinger (Fountains of Wayne/That Thing You Do!) and has appeared on ABC’s Good Morning America, NBC’s The Today Show, and Fox’s Good Morning New York. Sienna (Greene, RI) – With many years of collective experience in the New England music scene, the members of Sienna consider it their duty and responsibility to make the most sonically pleasing rock songs possible, alone with being kind and upstanding citizens in the musical community at home and abroad. Always busy writing, recording and playing shows, they have developed a chemistry that can only be the result of a fondness for each other and their musical contemporaries. They were a 2011 Rock Hunt Semifinalist and their “The Making Change EP” is due out this year. The Mighty Good Boys (Providence RI) – Formed in March 2011, The Mighty Good Boys burst on to the scene with their Appalachian laced rock and roll. They are in the process of recording their debut LP and can frequently be seen supporting major headliners at The Met, Fete and AS220. In the summer of 2012, The Mighty Good Boys played a Newport Folk Festival after-party with Providence favorites The Sugar Honey Iced Tea. In addition, they have shared the stage with Joe Fletcher and the Wrong Reasons, The Silks, The Devil Makes Three, and Smith and Weeden. Torn Shorts (Barrington, RI)- Torn Shorts started in June 2010 as a studio project with Josh Grabert, and has since evolved into a unique and energetic live show. While Josh Grabert’s primary instruments are guitar and vocals, during live shows he also plays kick drum, tambourine, and harmonia simultaneously; making Torn Shorts a live show not to be missed. Nominated for 2 Phoenix Music Awards in 2012, Torn Shorts has played The Met, Fete, and various other venues around New England. Rhythm Room Live (North Attleboro, MA) – Rhythm Room Live interweaves the power of percussion with dynamic vocals to create an explosive, captivating show that sticks with the audience long after it’s over. Integrating world percussion, horns, drums, piano, guitars, and keyboards, Rhythm Room Live creates a rich, full-flavored melodic sound that provides a a visually-stimulating experience for audiences of all ages. Since their formation in 2006, Rhythm Room Live has played Relay for Life in Washington D.C. and Showcase Live in MA. Kid Mountain (North Attleboro, MA) – Since their formation in 2011, Kid Mountain has achieved a significant level of success, finding themselves a semi-finalist to last year’s Rock Hunt. Their debut EP “Vistor’s Center” was released in January of 2012 followed by their first full length album “Happies” in November 2012. They have plans to release another EP later this year and have shared the stage with Maps and Atlases, Reptar, Hospitality, and Ex-Cops. Here We Just Dream (Bristol County) – Here We Just Dream was founded in 2012 by three original members of Pride of the Atlantic, an indie-prog outlet that played together from 2009-2011. Since January of 2012, they have been working on their self-titled debut EP. They have played at Firehouse 13, Dusk, The Middle East, Fete, and Midway Cafe. The Bitchin’ Aardvarks (North Scituate) – Our WILD CARD, voted in by YOU, the fans! The Bitchin’ Aardvarks were formed back in 2009 by three brothers. Last year they raised money through the Kickstarted Campaign to release their first album, a “20-song extravaganza” Lottery Winner, which is due out later this year. They have played The Met, The Spot, The Apartment, and AS220.